Snapdragon BatteryGuru is a powerful Android App which helps you save battery charge on Snapdragon powered processors. And believe me, Android devices running on Snapdragon processors do need battery life extension. 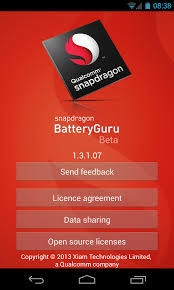 Qualcomm on Monday released the full version of Snapdragon BatteryGuru, an app that helps you save the battery life of your device. BatteryGuru extends the battery life on Snapdragon-powered devices by optimising its functionality. It doesn't need any manual configuration and runs in the background. The hueristic nature of the App enables it to learn the phone’s behaviour in two to four days and notifies the user that it is ready to extend the battery life. The App has already received more than one lakh hits since Qualcomm launched the beta version in February. Qualcomm has now also added addition language support for Chinese, French, German, Italian, Japanese, Korean, Portuguese, Russian, Spanish and Turkish languages in the new version. IF you have a Android device powered by Snapdragon processor, this must have App is available for download from Google Play here.